It’s graduation season and trying to come up with something fun and special for your graduate, besides the many gifts and whatnot they’re experiencing, can be a little challenging. How about throwing them one last group breakfast with their school friends? Keep the wow and food factor high, but make it simple when it comes to choices. There is no need to have platters of this, an omelet station, danish this and donut that.. one or two choices and you’re good! 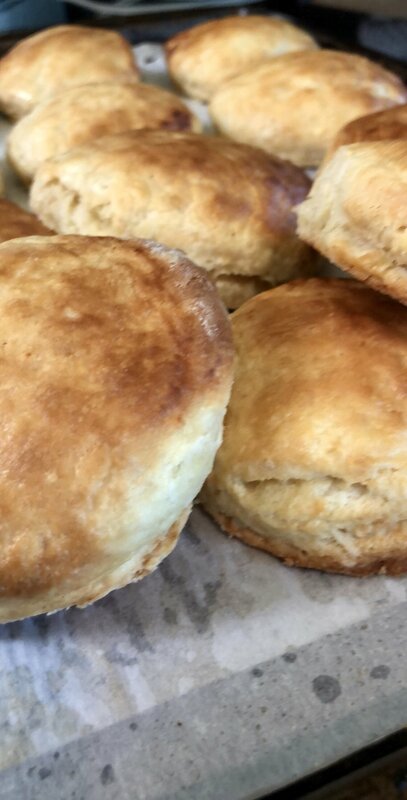 People love a good breakfast biscuit. They are easy to handle, you can load it with what you want, and more importantly… delicious. So I came up with a great “make at home” breakfast sausage (I prefer making my own breakfast sausage because I can control what goes into it), and of course there is my buttermilk biscuits. Add a Banana Yogurt Parfait with Hazelnut-Oat Crumble and you’re set for a fun breakfast with good friends! Happy Graduation to all those graduates out there… show the world what you got!! Preheat your oven to 425 degrees, and prepare a baking sheet pan by spraying it with cooking spray. In a large mixing bowl combine all of the dry ingredients. Give it a good stir so everything is combined. Cut in the butter and shortening by hand or with a pastry cutter until it resembles small peas. You want decent sized chunks of butter and shortening in your biscuits, unlike when making pie pastry. Add the buttermilk and gently mix until just combined. The dough will be sticky. 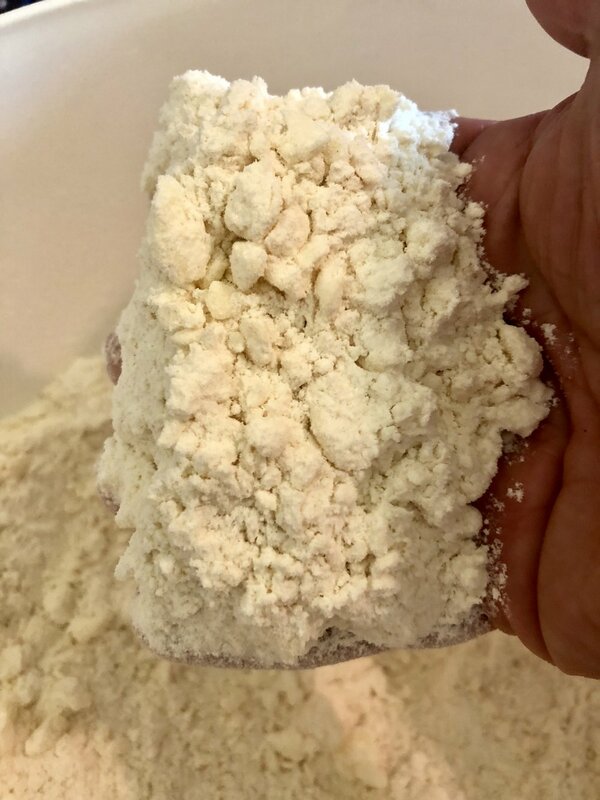 Turn the dough out onto a floured surface, and roll out to 1/2 inch thickness. Use extra flour if needed to help prevent the dough from sticking to much to the surface and pin. Cut the biscuits into 3 1/2”-4” rounds… I got around 10 biscuits. Of course, you may cut the biscuits into any size you like. Lay the biscuits onto your prepared baking pan and place in to the oven. Bake at 425 degrees F until golden brown, about 15 minutes. Nice, Crumbly, Pea Sized, pieces of butter and shortening ... ready for the buttermilk! In a large mixing bowl add your ground pork. To that add all the other ingredients except for the chopped blueberries. Hand mix (with your clean hands) everything well, like you would when making meatloaf. Squeeze, fold, mash, flip, smack it all until everything is completely and evenly mixed. Add the blueberries and mix in gently with your hands. Don’t squeeze or work the sausage meat too hard because you want to keep some sibilance of whole/half berries as possible. In a small jelly roll pan or a cookie sheet with shallow slides, lay down parchment paper. Be sure the sides are covered as well. Spray the paper with cooking spray and dump the sausage meat into the center. Spread it out evenly so that it is at least 1/4-1/2 inch thick. We’re cutting these into sausage patties so think about how thick you want those patties to be. Chill for at least 1 hour or even overnight, covered and in the fridge. When ready to cook, prepare another sheet pan by spraying it with cooking spray. Set your oven to 350 degrees and start preheating. Now, depending on the size you’re wanting the sausage biscuits, pick out a biscuit cutter appropriately. Because sausage shrinks while cooking I recommend choosing a cutter one size larger than what you will use to cut out the biscuits… you’ll want an equal cooked patty to sausage ratio for the biscuit. After cutting out the patties from the pan, begin heating a fry pan with a little oil. Gently brown each sausage patty on each side. Careful to use moderate and blacken the sausage. Place the browned patties on the prepped baking sheet, and place in the oven to finish off cooking. Because of the fresh ingredients including the maple syrup, there is a chance for the sausage to burn if cooked all the way in the pan. Just brown and finish off in the oven! Keep the sausage warm until ready to place into sliced biscuits. Serve with more maple syrup for sticky, salty and sweet grab and go breakfast! Depending on what size parfait glasses you are using (and I used some fancier drinking glasses that I had available) and their size, is how much Vanilla Yogurt and Bananas you will need. I mix in a little honey with my Vanilla Yogurt just to make it sweeter, but that’s your call. Layer each parfait with yogurt, fresh banana, yogurt, crumble and banana, finally topping it off with the vanilla yogurt. Add banana and crumble as a garnish on top. Keep chilled until ready for the graduates and friends! Ready to press out in the pan and to bake! Combine all of the ingredients in a food processor and pulse to a sticky crumb mixture. Turn out onto a prepared sheet pan and press flat (it doesn’t have to be pretty). Bake in a 375-degree oven for 10 minutes. Remove…cool… break up as needed.